The PC Engine SuperGrafx (PCエンジンスーパーグラフィックス), commonly referred to simply as the SuperGrafx (スーパーグラフィックス) is a video game console released by NEC in November 1989. 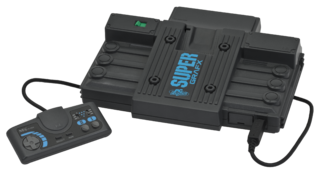 The SuperGrafx was developed as an upgrade to the already successful PC Engine in Japan, aiming to be a "true" 16-bit console capable of competing against newer rivals, the Sega Mega Drive and likely the then-upcoming Neo Geo by SNK and Nintendo's Super Famicom (as well as various Japanese computers). For information, see PC Engine SuperGrafx. Pages in category "PC Engine SuperGrafx"